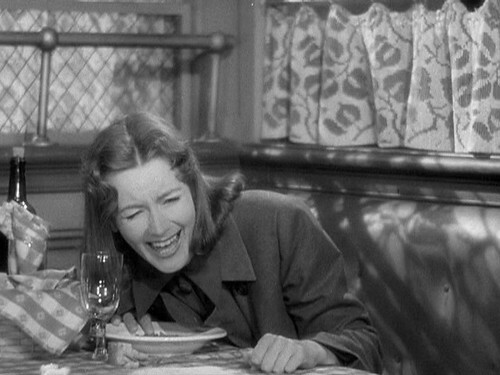 The Film: Garbo laughs in Ninotchka. The Stars: Greta Garbo, Melvyn Douglas and Ina Claire. Source Material: An original story by Melchior Lengyel with an original screenplay by Billy Wilder, Charles Brackett and Walter Reisch. Count d'Algout (Melvyn Douglas) and Ninotchka (Greta Garbo) view the Eiffel Tower with a tour guide. Awards: Four Academy Awards nominations: Best Picture; Best Actress for Garbo; Best Original Story and Best Screenplay. The Plot: Stern and rigid Comrade Ninotchka Yakushova (Greta Garbo) is sent to Paris to sort out a mess created by three bumbling appartchiks (Sig Rumann, Felix Bressart and Alexander Granach) who are trying to sell jewelry confiscated from the Grand Duchess Swana (Ina Claire). Ninotchka slowly begins to soften under the spell of the City of Lights and the dashing Count Leon d'Algout (Melvyn Douglas). The famous moment where Garbo laughs. Backstory: Garbo was one of the brightest stars in the MGM firmament during most of the 1930s, but by 1939 the public had tired of the prestige dramas she was known for. Studio bosses turned to director Ernst Lubitsch, known for his sophisticated comedies, to lighten up Garbo's image. 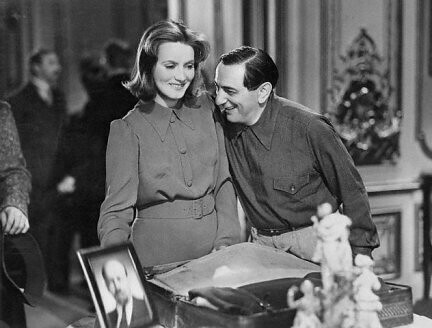 Lubitsch and the screenwriting team fashioned Ninotchka out of a three-sentence pitch from Hungarian writer Melchior Lengyel: "Russian girl saturated with Bolshevist ideals goes to fearful, Capitalistic, monopolistic Paris. She meets romance and has an uproarious good time. Capitalism not so bad after all"( quote from TCM database). Greta Garbo and director Ernst Lubitsch share a laugh on the set of Ninotchka. Best Performance: Garbo responded to the Lubitsch touch with one of the best performances of her career. Her gradual transition from robotic martinet to a tender woman in love is both funny and touching. Greta Garbo and Melvyn Douglas in a publicity still for Ninotchka. In the film, Garbo wears a much more elaborate gown in the restaurant scene. Best scene: A tipsy Garbo tries to lead a workers revolution in the ladies washroom of a fancy Parisian restaurant. Best Line: "Suppress it." Ninotchka to Count d'Algout after he first attempts to flirt with her. Cameo performance: Bela Lugosi, best known for playing Dracula, gave up his blood-sucking ways for a bit to play Ninotchka's boss Comissar Razinin in a funny cameo performance. 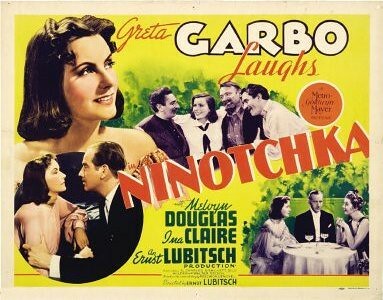 Soviet Satire: Lubitsch and the screenwriters used Ninotchka to poke some fun at the Soviet Union and dictator Joseph Stalin. Ninotchka depicts life in the USSR as bleak, cramped and humorless (clip below). Ninotchka lives in a tiny apartment with three other women and only one bathroom for the whole building (Ninotchka's roomate ruefully remarks of one frequent bathroom user, "you never know if he's going to the washroom or the secret police"). Fun Fact: MGM had a hard time choosing a title for Ninotchka. They went through Give Us This Day, This Time For Keeps and A Kiss From Moscow before settling on the name of the lead character. Studio bosses were worried that the American audience would have trouble with the difficult name, so the MGM publicity department came up with a clever tagline: "Don't pronounce it -- see it!" 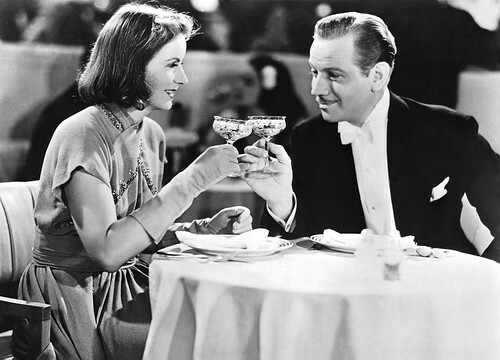 Why it's essential: Ninotchka is a landmark in the romantic comedy genre thanks to the witty screenplay, heartfelt performances by Garbo and Douglas and the famous Lubitsch touch. It's still one of the best rom-coms around 75 years after it was made. Next week, Shirley Temple goes from riches to rags in The Little Princess.